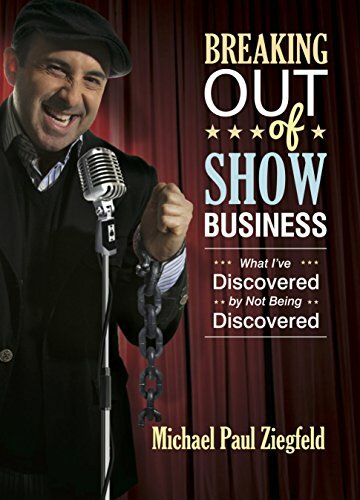 Michael Paul Ziegfeld’s Breaking Out of Show Business: What I’ve Discovered by Not Being Discovered is a rare look at an unorthodox life and a fun dose of celebrity dish, and quite possibly required reading by would-be stand-up comedians and performers alike. This is not to say that young performers should necessarily follow Ziegfeld’s career path—unless they are eager to remain in relative obscurity—but they could certainly learn from his admitted career blunders and analyze his choices before setting out on their own. His career as a moderately successful comic and ventriloquist allowed him to tour the world and live an offbeat lifestyle performing in hotels, cruise ships, casinos, and retirement homes, and even provided him an audience with the queen. Though he is often self-deprecating and perhaps remorseful about some of his life choices, he’s certainly led an interesting and fascinating life, and could be more proud of his own accomplishments. While there’s a healthy dose of behind-the-scenes showbiz stories, like his tales of working with Wynona Ryder, Mike Myers, and teaching ventriloquism techniques to Kevin Spacey, there are a some sections of name-dropping that feel a tad excessive. save for a few moments of reflection about career blunders, the majority of this book is comprised of showbiz stories or “unrelated craziness, tied together” as Ziegfeld, warns. For those interested in the behind-the-scenes life of a working performer, this book should be a fun read.